Nothing can be more frustrating than when you face problems with your turf. Turf is a long-term investment and it’s certainly not something you want to be digging up and replacing frequently. While maintaining your turf is the best way to avoid most problems, sometimes there’s no way to avoid what happens to your it. Thankfully, there are ways to deal with the issues. The best way to keep your turf looking amazing all year round is to know how to check, maintain and treat it before problems get too serious. Dry grass not only looks poor, but it generally means your turf is under stress. It seems obvious that dry grass can be prevented by watering. However, always remember the key to watering is to give dry grass a deep soaking to allow the water to reach and strengthen the root system, which will then lead to greener, healthier grass. Choose a deep, longer watering time, over a quick spray and you’ll see results. Your turf is looking beautiful, and then suddenly you spot a weed, then another one, and another one! For those who love their lawns, weeds can be a big pain. Mowing regularly is the best way to stop weeds from growing and cultivating a healthy, thick and well maintained lawn will prevent weeds from taking stronghold. Don’t stress too much about a couple of weeds here and there, but if you sense the weeds are getting out of control, then target them with a spot weed sprayer. Make sure to read the label carefully to ensure it won’t kill your grass too. Yellow lawn patches are never a good look amongst a green, healthy lawn. The key to getting rid of, and preventing yellow patches in your turf, is to find out how they got there in the first place. 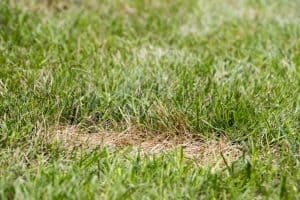 Yellow patches lawns are often caused by pet droppings or urine. Yellow patches can also occur when that area of the lawn has been over fertilised. Preventing yellow patches from happening depends on the reason it’s occurring. If it’s just the beginning of a lawn going dormant over winter it can generally be left alone. Water the patches after your pet urinates on it to avoid the pH levels of the soil being affected in that area. Fungal diseases such as brown patches are commonly found in certain climates, or when watering is excessive overnight. If it’s particularly concerning, you may decide to remove the area and patch with new turf. Identifying the disease and using the appropriate pesticide or fungicide is enough to not only remove the disease, but also prevent it from happening again. Since 1974, Hi Quality Turf has offered a wide range of popular residential and commercial turf varieties to homes and businesses such as Buffalo Grass, Couch Lawn, Empire Zoysia, Kings Pride Buffalo, Palmetto, Sapphire Turf and Kikuyu. We understand common problems with turf and are happy to discuss preventative measures with you. We deliver turf supplies and within Sydney, Wollongong, Newcastle and the Central Coast. Contact us today on (02) 45 723 666 for quality services.